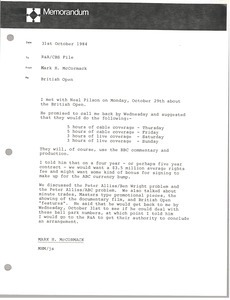 Great Britain - Notes from a meeting with Neal Pilson about television coverage of the British Open. 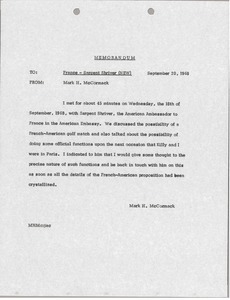 Great Britain - McCormack notes that he spoke with Sargent Shriver about the possibility of a French-American golf match. 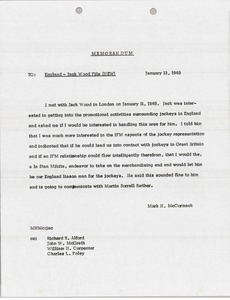 Great Britain - McCormack notes that he met with Jack Wood, who is interesting in getting involved in promotional activities surrounding jockeys in England. 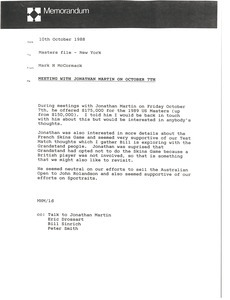 Great Britain - Notes from a meeting with Jonathan Martin, and his offer for the 1989 US Masters. 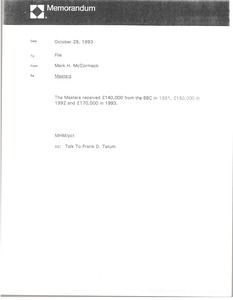 Great Britain - McCormack notes the amount of money that the Masters received from the BBC in 1991, 1992 and 1993.